I’ve experienced anxiety regularly for the majority of my adulthood but the past few months have seen a real increase in my symptoms and if I’m honest it’s been quite a struggle! I’ve spent the last year with such a strong focus on myself; my days consist of the very things that I preach on @EverydayAmazingYou – exercise, positivity, gratitude, rest, mindfulness – self care to the max; but over the last few months and weeks especially this just hasn’t been enough. Granted I’m going through a divorce so it’s understandable that my everyday practises aren’t quite taking the edge off but I’ve found it so frustrating that no matter how much self care I implement into my day I can’t shift these anxious feelings. So, before going into any kind of counselling or medication, (something I would definitely do if I couldn’t self heal, and counselling especially is something I still plan to do in the long-term) I thought I’d try some alternative ideas. Some of these I’ve tried out consistently for the past few weeks and others I’ve only experienced once but I thought I’d share my experience with you guys in the hope that it can maybe help at least one of you who is struggling. There will also be a space at the end of the blog post where I’ll share the fab tips that were shared by my followers over on @EverydayAmazingYou – so if you ever want to get involved and be featured in a post like this, or simply join the discussion then please do head over there and follow! This alternative treatment (I guess that’s what you’d call it) is something that I believe came to me as a bit of a sign. I was sat talking to my new school mum friend, opening up about my struggles one weekday evening after a particularly bad day when all of a sudden she said ‘you need to see my Aunty Gwen’. It turns out that her aunty is a spiritual healer, who helps many people daily out of the goodness of her heart. She doesn’t charge and is offended when you offer money (I placed a tip down and ran on my way out); and she’s been doing it for years with amazing results. I went to a room in her house, sat on the chair and spoke a bit about my struggles and then she got to work. I guess it’s similar in a sense to reiki in that she used her hands with very light contact and placed them around my body to heal it. The major difference though is that with spiritual healing she’s working with ‘the above’, a phrase that she uses to suit everyone but for her means with God. I guess for those that aren’t religious it could make them feel uncomfortable so ‘above’ can be associated with a higher self, alternative power etc. I felt an instantly overwhelming sense of emotions and burst into tears before feeling calm and serene. At points I felt such energy around my hands and feet when she was working on them and the major sign for me that it was working was when my stomach felt like someone was trying to punch their way out of it – not dissimilar to a baby kick but much more forceful and she said afterwards that was the anxiety knots in my stomach undoing. After the treatment her hands were very hot from all the energy created and when we sat down for her to show me some information on crystals (next tip) I started to shake uncontrollably as if I’d either not eaten for too long, drank too much coffee or had a real chill in my bones. I guess this was just because I’d experienced so much energy and healing powers but having such a physical reaction really confirmed to me how real the experience had been! I definitely felt a huge weight lifted after my session and even though I have experienced anxiety since, it certainly kickstarted my healing journey and I think it would be a wonderful thing to do weekly or fortnightly. I’d been interested in crystals for some time before my spiritual healing session but I just didn’t have the first clue on where to start. I’d search online for the best ones to suit my needs and looked on Amazon for the best prices but I just couldn’t commit. I knew I needed to visit a crystal shop so that I could physically choose the right ones for me and Aunty Gwen directed me to a shop just around the corner from her. I went in with the plan to pick up some Rose Quartz to heal my heart (something I’d Googled) and some Amethyst to help me sleep (recommended by Gwen). As I walked in I gave a brief idea of what I was going through and the man in the shop recommended Citrine, the sunshine happy stone, before the woman quickly told me to simply scan the crystals with my eyes and see what I was drawn to. She said as much as certain crystals are amazing for particular things, they may not be right for everyone so the best thing to do is pick up what I’m drawn to and go from there. The first crystal I was drawn to wasn’t particularly pretty; I couldn’t understand why I was drawn to it at all but when I read out it’s particular name she told me it was from the Jasper stone – a true sign as my eldest son is called Jasper! The stone helps you to move forward in life discovering your purpose – perfect! I was then drawn towards Aventurine which is a higher power healing stone that also helps to overcome bad habits, remain calm and aids in communication. 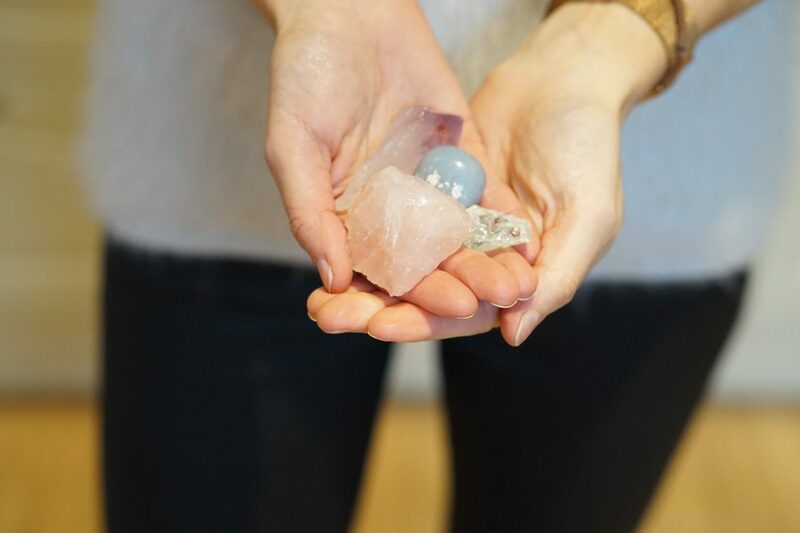 I keep the crystals on my bedside table, sometimes carry them in my bra, often in my handbag and sleep with some under my pillow. I always have at least one on my person depending on which one I feel drawn to that day and I find such relief from them! Sometimes I’ll hold them or rub them and other times just having them near me gives me a sense of calm; and depending on what my anxieties are stemming from, whether it be love, work or life in general at the time I tend to be drawn to the associated stone. 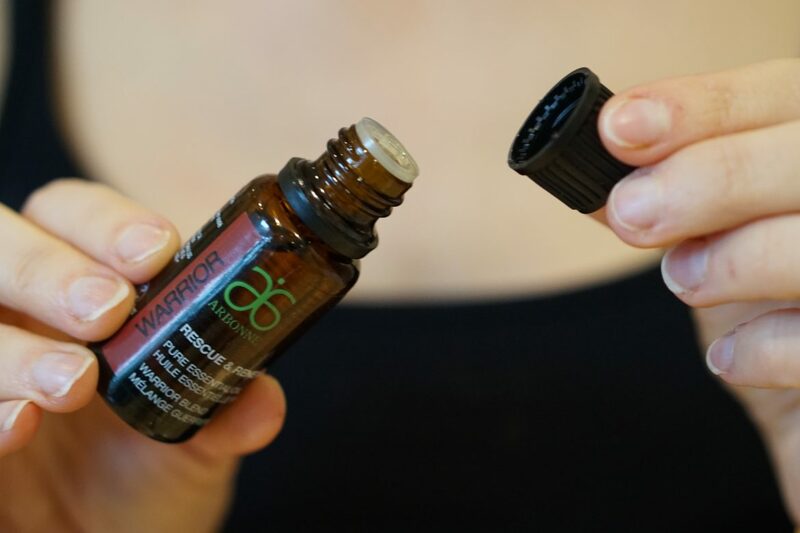 Essential oils are again something I’m relatively new to. 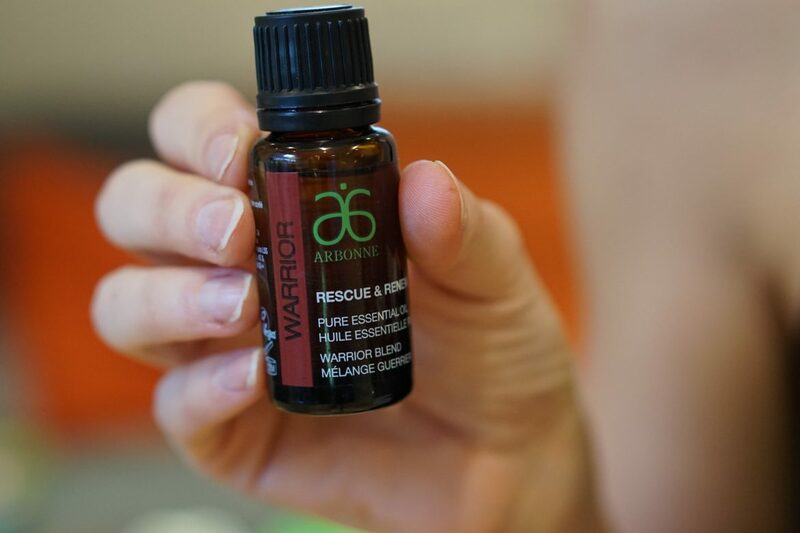 For the past year or so I’ve used lemon for cleaning, eucalyptus for colds and lavender for relaxing – pretty basic really but then I discovered the Rescue and Renew Warrior Blend by Arbonne (It was kindly sent to me by a lovely lady on Instagram) and I use it daily in my humidifier and sometimes rub it on my temples for added zen! I find if I pop it on when I wake up and when I go to bed it really helps to not only calm me but to empower me as well. The blend promotes feelings of warmth and comfort and I don’t know if it’s just the name that does it but it really gives me a sense of strength. I’m so excited to talk about this one as it gives me such instant relief and I would honestly recommend it to anyone! CBD is a cannabinoid which is a chemical compound found in the cannabis plant. Unlike THC which is the most well-known cannabinoid, it doesn’t make you high as it isn’t psychoactive, but instead it offers a range of health benefits aiding in physical pain, sleep, depression and anxiety. It’s a naturally occurring substance and completely legal in the UK, in fact you can purchase it in Holland and Barratt as well as other high street stores and despite it tasting like pond water, the effects have been amazing! I would definitely recommend that you do your research as there are so many brands and I’m sure each one may vary in terms of dosage but for my one (linked here) I can take 2-5 drops 2-3 times per day. I drop it under my tongue, hold it there for a minute and then swallow – I always swallow it with a drink of water to take away the taste quicker. I feel the effects within 15-20 minutes, it does state that it can take up to an hour if you have a full stomach but I always feel it quite quickly; and when I say feel the effects I mean my anxiety reducing drastically and a sense of calm. My mind doesn’t race, I sense clarity and feel generally well as the CBD oil also contains antioxidants, vitamins and minerals. I tend to take it as soon as I wake up, if I’m not due to wake up for a while I still take it so that the effects have kicked in by the time I get up properly. I suffer quite badly with morning depression so first thing in the morning is the time that I feel the benefits most. Some days I don’t take it at all for the rest of the day but others I’ll maybe have a few drops late afternoon once the day has started to calm down but my mind is still racing, and before bed if again, my mind is racing! This is a treatment that I had such high hopes for. I’d heard amazing things, went in fully expecting to feel all kinds of immediate benefits and boom left feeling disappointed and like I’d wasted £55 on 5 needles in my body, a heat lamp on my belly and me practising my breathing for 30 minutes on my own (a pretty good description of how my hour session went down). So why are you mentioning it in your tips I hear you ask? Well, despite leaving feeling a little disappointed, I’ve not had morning depressions since, I literally feel like I couldn’t give a crap about insignificant people or problems (something I’d spend hours worrying about before) and I’ve actually felt genuinely happy and content. After my session I took to Instagram to share my disappointment and a few people did comment to tell me that they never feel the effects of acupuncture until the following day; well after a couple of days I suddenly realised that there had been a huge shift in my mental state and general air about me. I felt like I’d been unblocked which was exactly what the acupuncture therapist had told me she would do! Again, its something I think I’ll need to do regularly, perhaps once a month as maintenance but I’m excited to see if I feel the same sense of freedom next time! So there you have it, 5 alternative things that I’ve tried to relieve my anxiety; each playing their part in different ways and all helping me to manage and some days even alleviate the symptoms fully. The combination of deep spiritual healing, unblocking and daily rituals is helping me to not only heal from within, working back towards the root causes of my anxieties but to manage the day to day feelings that I experience at present and I’m loving implementing it all into my life! 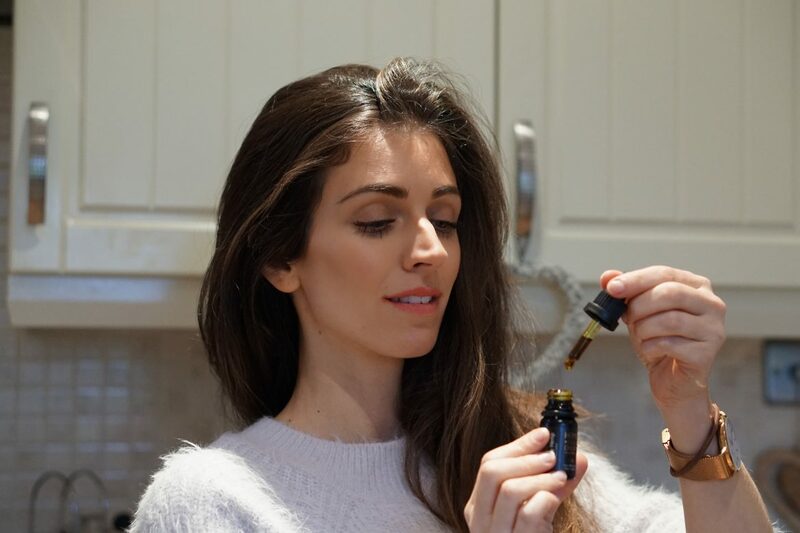 There were also a lot of people who said that they use CBD oil for various reasons and love it! I hope you’ve found this useful, if you have any more tips to add then please do pop them in the comments below and let me know if you try any of these!